This excerpt containing the cello solo from Tchaikovsky's Swan Lake Suite, Op. 20a has been edited by Desmond Hoebig, Professor of Cello at the Shepherd School of Music at Rice University and former principal cellist of the Cleveland, Houston, and Cincinnati Symphony Orchestras. Hoebig's bowings, fingerings and other editorial markings have been added throughout the score. Tchaikovsky's Swan Lake is a four-act ballet that tells the story of Odette, a princess turned into a swan by an evil sorcerer's curse. It premiered in Moscow in 1877, performed by the Bolshoi Ballet. The suite consists of music drawn primarily from acts II and III, presented as two sets of six and eight movements respectively. 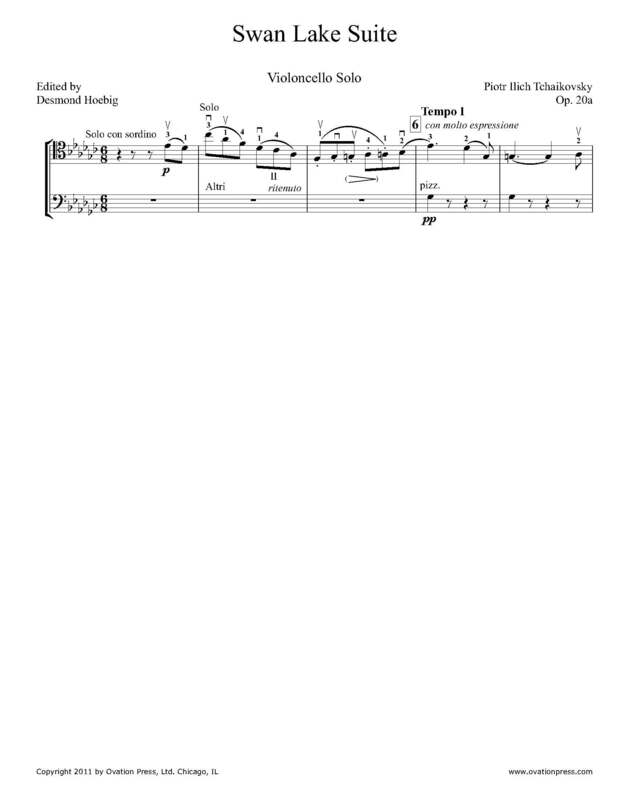 Download and print the score today to gain access to expertly edited Tchaikovsky Swan Lake Suite cello fingerings and bowings from Desmond Hoebig! Please note: This score is an excerpt containing the cello solo in the fourth movement.